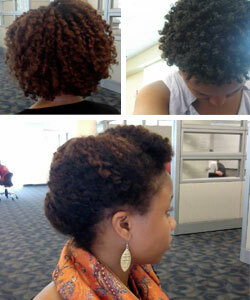 Does your lifestyle leave you too exhausted to styling your coils everyday? Have you made multiple attempts to achieve second day hair with a pineapple and a spritz of water? Length is one of the factors in finding low maintenance coily hair styles that last anywhere from three days to a week. The key to maintaining set styles for multiple days is starting with a defined style, preferably something that is styled while the hair is wet or damp. Whether it's wet set or a dry flat-twist out, you'll lose more definition over time, so the more defined the hair is to start with, the longer it will last. Learning how to achieve your desired style comes with trial and error, but staple elements in maintaining the health of your hair shouldn't change. Don't compromise the health of your hair for aesthetics. Your hair will also be easier when you treat it with proper care. Remember that water is the only source of moisture, so when setting your hair, it's important to at least spritz your tresses before sealing with an oil or butter mixture. How do you achieve lasting, coily hairstyles?